Available in sedan, convertible, and hatchback bodystyles, the Audi A3 combines strong 4-cylinder turbo engines with sporty handling and a comfortable ride, as well as an upscale cabin. AWD and a hybrid are available. 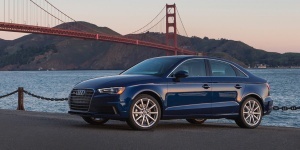 For 2016, the Audi A3 lineup is expanded by a hybrid version. A rear-view camera, parking assist, and heated mirrors are now standard on all models, as are auto-dimming rear view mirror with compass, the Technology package, and the S line style package on Premium Plus models, while the Prestige trim adds Active lane assist, Audi pre sense front, and adaptive cruise control.